Top Gear has not been terribly supportive of electric cars. However, in a recent BBC special entitled "Are Electric Cars the Future,"James May, despite still having some reservations on the concept, has begun to support EV ownership, so much so that he has decided to get a new BMW i3. BBC Radio 4 - You and Yours, Are electric cars the future? Are electric cars the future of motoring in the UK? With Top Gear&apos;s James May. "We've known for a long time that the electric motor is the ideal way to propel an electric car," he said. "We're discovering that there's a different sort of pleasure in motoring in an electric car because of the smoothness, the silence." When asked about his "range anxiety," May opted to get the range extender option that adds a small gas engine for the situations where a charging station is not in the immediate vicinity. "It's called a range extender," he said of the i3 REx's tiny range-extending petrol engine. "It really ought to be branded 'pure cowardice,' because that's what it is and that's why I've got one," he joked. "You don't have to use it, and I will try not to use it," he promised. "It's a bit like when I tell the doctor I'm not going to do any drinking or smoking but I will do a bit. I will try to use the electric car infrastructure as much as possible." Given Mr. May's penchant for unique cars that push the boundaries of engineering and design, yet are still practical for everyday use, it would seem that the i3 would be a great fit for him. "I sort of want to be part of the 'experiment'. 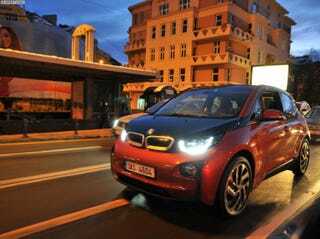 I don't know what the answer is — or if a car like the i3 is the long term future of the car," May said. "It's not that small. It's actually quite roomy inside. It's almost a small people carrier." I'm excited to see how May chronicles his ownership of the i3, and I'm sure his petrol loving cast-mates will find plenty of opportunities to poke fun at his expense.